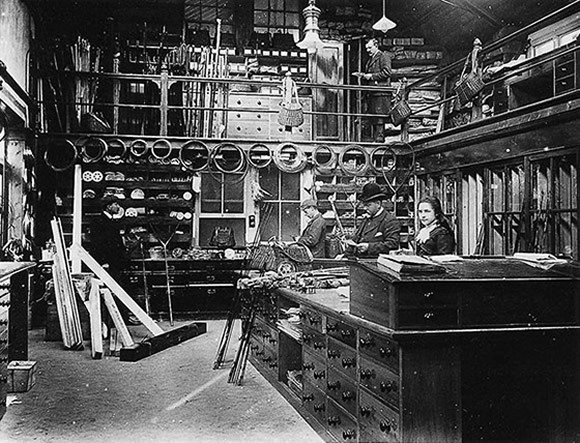 The vast majority of anglers alive today know Hardy’s as a tackle wholesaler, but for most of its history, the firm was run on a very different principle - it was a direct sales mail order business that operated a handful of retail outlets to satisfy customer demand in big cities and dealt through a network of agents abroad. The rise of a family business in nowhere’s ville Northumbria to become the best-known fishing tackle manufacturer in the world was no accident - on the contrary, it had a great deal to do with hard work, uncompromising values, listening to customers and engineering know-how, but nonetheless, a significant part of the company's success was due to a thick brown envelope which was dispatched to its customers' homes at the beginning of every season. The catalogue inside was known as the Angler's Guide and tens of thousands of fishermen, all over the globe, spent their winter evenings pouring through its pages while they dreamed of fishing past and fishing yet to come. How did this extraordinary state of affairs come about? In the dying years of the nineteenth century Farlows, Cummins and Allcocks published their own catalogues, as they had done for many years before the upstart from Alnwick came on the scene, but these worthy productions lacked the breadth, the imagination and the sheer excitement that the Angler's Guide offered. There were many reasons why this situation came to pass and by the end of this book, I hope I will have introduced you to them all, but the main theme was that Hardy’s passionately believed in the tackle they designed and built in their Bondgate factory and this belief fired the words in their catalogues. Farlows introduced a new item with a single page ad, whereas by contrast, a new Hardy product very frequently got a six page spread, followed by another two of testimonials, backed up with periodic reminders of its merits at the bottom of half a dozen other pages scattered throughout the rest of the catalogue. Allcocks sold rods, but Hardy’s sold rods built from a bamboo stiffened an extra 25% by a secret process and held together with a special glue which meant the tips could be bent through more than a complete circle (in the adverts at least) without suffering any damage. Who could resist that sort of marketing? This approach represented a revolution in the way fishing tackle was presented and it was backed up by a similar revolution in design, because the founders of Hardys were practical engineers as well as fishermen and they quickly gained a reputation for solving problems that others had not. I use the word practical advisedly – William, J.J. and even Forster Hardy learned their trades by apprenticeship and although they had good educations, book learning didn’t have a great deal to do with the way they worked. They had been taught how to deal with materials by feel and to solve problems using common sense and good old trial and error, which meant that, at times, theory didn’t get much of a look in. As it happened, this approach fitted in very well with designing rods and among William’s notes there are some fine examples of how he went about this, for example the rod which the company built to the specification of the champion amateur caster, Frederick George Shaw, and which was listed from 1907 to 1912. The hands-on ethos would also catch them out once or twice, not least with the use of Alumin in their early sea reels, but we will get to that later. Even the names that Hardy’s gave their products had an epic ring to them: in the 1890s you could fish with an Ideal rod, to which you had attached a Perfect reel, while your feet were protected by Invincible brogues. As if this avalanche of promotional information wasn’t enough, the Guides relentlessly detailed the company’s success in winning tournaments and piled up royal warrant upon royal warrant until readers must have begun to wonder why their competitors didn’t just throw in the towel and go home. It isn't quite accurate to say that the older firm's mail order ventures went down with all hands, but the Alnwick company did some serious damage to them and carved out a substantial slice of their trade thanks to the pizazz of a catalogue that squeezed in more pages than the average Russian novel. Compared to the Angler's Guide, the offerings from the other tackle companies were anaemic - and how could they compete when the Hardy catalogue read like a thriller; championed destinations on the far side of the globe; and advertised a share of completely unnecessary gadgets that no-one worthy of the name fisherman could resist. Fishing trips to exotic destinations are the preserve of a lucky few even now, but Hardy customers could read about them 100 years ago - and then flick a few pages further on and dream about buying every single item of gear that the Alnwick company said they would need if they ever happened to get there. It couldn't last forever and it didn't. 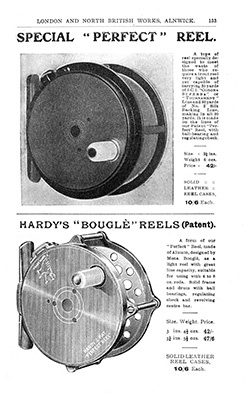 Although the Angler' Guide weathered two world wars and the Great Depression, the business model that Hardy's had built around it became unsustainable and although the catalogue continued, failure of the firm to modernise in order to compete meant that it had shrunk to a shadow of its former self by the late 1960s. Where once Hardy's had been a one-stop shop for fishermen around the world, it now had to contend with a very technically savvy far-eastern tackle industry and the firm responded by pulling in its horns and concentrating on its core products, an area in which it still knew few rivals. Even that would change in time, but the period this book covers, from 1872 to 1914, was the golden age as far as the Anglers’ Guide was concerned and the crash was yet to come. Thanks to changes in the market and the appearance of new technologies like the Web, we will never see the like of the Guide again, but it is impossible to flick through even the most down at heel copy and not feel the excitement that our parents, grandparents and great-grandparents must have felt when that much anticipated knock on the door came and the postman handed over so many hopes and dreams. This is the story of the vehicle they came in. 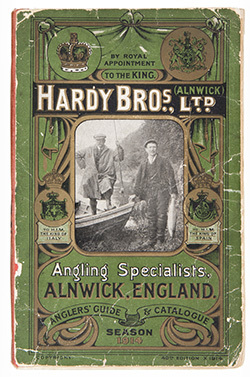 If you want to learn more about the history of Hardy's of Alnwick up to 1914, read The Anglers' Bible, which is available from the Medlar Press. You can visit Hardys' website by clicking here.